Alesis is a brand who has created a huge amount of musical products over the last decade or so. As the world of music has become more ‘digital’, Alesis has been one of the brands who has created products that push the envelope. In our Alesis Recital 88 Key Digital Piano review we take a detailed look at the features of this keyboard, designed for beginners to intermediate players and built with ease of use in mind. There is an Alesis Recital Pro which we will also look at in the same article. 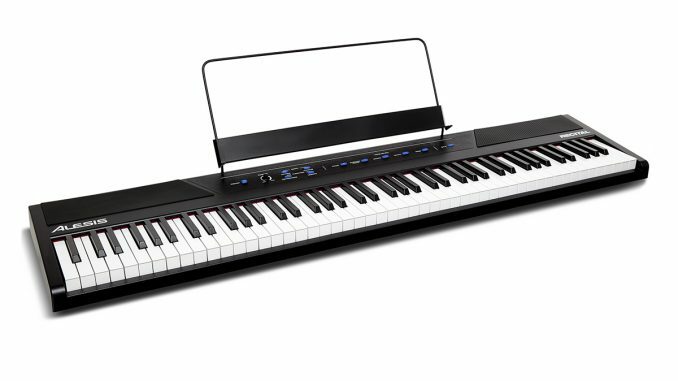 So what is a “beginner digital piano” anyway? When we’re first starting out, most people aren’t looking for something with all the bells and whistles. Home digital pianos are ones which are relatively lightweight and therefore easy to move around. As well as this, a good beginner electric piano is one that doesn’t necessarily have an over-the-top amount of features. If you are a beginner, you can easily be overwhelmed by a lot of controls. Some keyboards and digital pianos look like you need a degree in music technology to be able to set up the sound you are looking for. A good beginner model will give you options, but also simplicity, and that is definitely what is on offer with the Recital. The Recital pro is a bit more expensive, as you would expect. More on that later. In general, the recital 88 key digital piano is one of the cheaper models on the market. Compared to Roland and some of the other brands, this is right at the lower end of the cost. This is one of the reasons it is marketed for beginners, and though this may not be ‘concert standard’ its features are certainly impressive when you consider the relatively small outlay. As we’ve already briefly mentioned, the features of the Alesis Recital are impressive without being outlandish or hard to navigate. This piano truly has everything you need to get started. 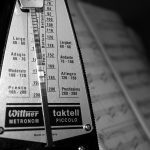 A metronome built-in allowing you to practice at tempos between 30 and 280 bpm. Can be powered by a wall adapter or batteries, great for portability and playing on-the-go. Semi-weighted keys for a realistic feel. 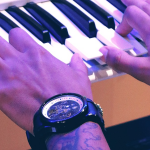 The pressure you put on the keys is linked to the volume just like on an acoustic piano. 1/4 inch headphone jack so you can practice in private and not annoy those around you! 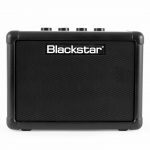 20 watt built-in speakers which pack a fairly good punch, great for band practices and playing with others. USB-MIDI compatible. Plug this into your laptop or computer and you can use this keyboard to control virtual instruments, opening up a world of different sounds and making it useful for beat making and producing music. RCA Output to connect to an amplifier, great for bigger gigs or recording. 88 keys, just like a real acoustic piano. The Recital has five different voices including piano, organ, bass and even synth! These voices are great quality but the truly impressive feature is the way Alesis have made a product that you can customize. You can layer any two sounds for a fuller overall sound, and you can even play in ‘split’ mode, with one sound on the left hand and one sound on the right, this is great for soloing or playing bass notes under a chord sequence for instance. Plus it can add an extra dimension to your sound! The Alesis Recital 88-key Digital Piano is available in bundles or on its own. Most of the bundles we’ve seen include sheet music holders and digital power adapter for plugging into the wall. Another bundle has all of the above but also a stand, stool and even a sustain pedal for a complete piano experience, and absolutely everything you could possibly need to get started. 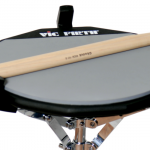 It is easy to see why this is so popular among beginners, even the models with all of those extra accessories don’t cost a lot in music terms. One of the bundles we saw even comes with three months membership to “Skoove Premium” which is an online platform to help learners with lessons and how-to guides for starting to play the piano. All-in-all, with such an amazing amount of features this is an amazing product for beginners, but it also goes further than that. The inbuilt sounds are great and even once you’re able to play to a good standard, you probably won’t outgrow the Alesis in a hurry. The Recital Pro is a model that looks very similar, and though it is a little more expensive it has some nice little bonus features. The hammer action keys are very realistic feeling and give a truer representation of playing the piano, setting you up perfectly should you ever graduate to playing upright or grand pianos. The five voices on the beginner model have been upgraded to 12, and you can still layer and split the sounds for even more possibilities. A few more cool features set this apart. A record mode lets you listen back to compositions and practices, and you can split the keyboard into two sets of octaves with the same notes at the same pitch so one person can be teaching on one side with a learner on the other. Of course, the recital pro has 88 keys too, and all of the other features on offer with its smaller sibling. It isn’t quite as light and portable which is to be expected. Alesis is a brand which continues to impress. Even though they have a huge amount of different music products, it doesn’t stop them from specializing. Their Alesis Recital 88-Key Digital Piano is a triumph at the price range and is well worth considering for beginner and intermediate players. 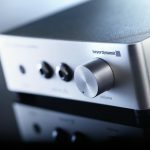 A huge amount of features and sounds but a simple to operate interface go together to make a top overall sound and a product that the vast majority of reviewers have given five stars. There is no need to just take our word for it as most people to purchase the Recital on Amazon and elsewhere online have left hugely positive reviews, praising the value for money and overall sound. 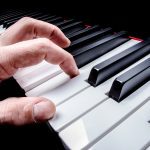 The bottom line is that if you are looking for a digital piano to learn on or play at home as a hobbyist, the Recital is a great option. If you are looking for a concert digital piano with all the possible bells and whistles, it might be worth spending a little more for a better action and a few more sound options, but for most, the Recital probably won’t leave you wanting more.